REI provides research and consulting services for specialized incinerator applications. Projects have focused on evaluating incinerator performance, emissions and operating challenges. REI provides modeling analyses for a variety of incinerator types and corrosion monitoring systems for MSW or other incinerator types subject to highly corrosive environments. REI’s combustion simulations tools were combined with specialized chemical mechanisms to analyze operation of a chemical weapons incinerator. 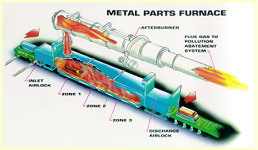 Modeling objectives included evaluation of operating conditions for improved furnace performance (increased throughput), indication of extent of chemical weapons destruction, assessment of refractory wear, analysis of products of incomplete combustion, and evaluation of effects of oxygen deficiency on chemical destruction. REI led a team to develop a solid waste incineration system for NASA’s Advanced Life Support Program. Modeling and experimental techniques were used to design the system. Key project tasks included design and performance of the feed system, fluidized bed combustor, particulate collection, and catalyst beds. Pilot-scale system was designed, built, tested and delivered to NASA.